The view here is from the south side of the kiri muhuda, or "milky sea." It was here that Herbert Wace, Government Agent, built the city park. 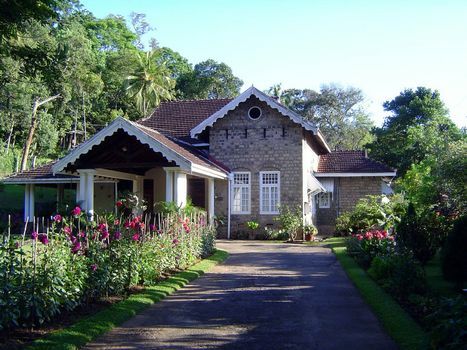 It was here, too, that the British built bungalows. Most have been enlarged past recognition. Here's one in fairly pristine shape. 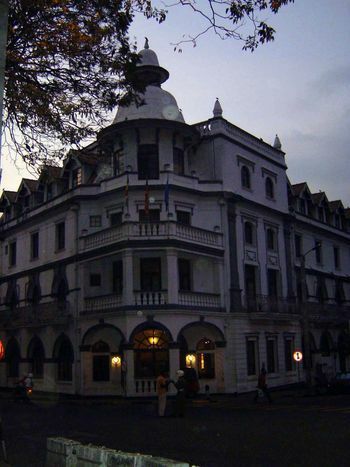 Here, too, at least for a time, was the Kandy Club, now the Hotel Suisse. 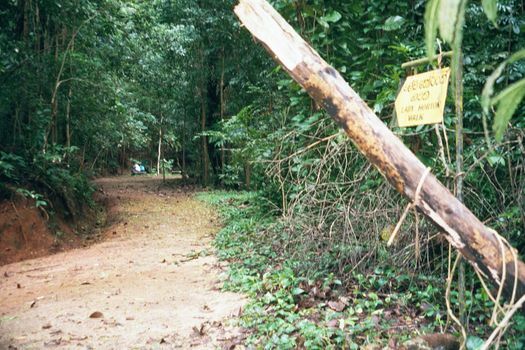 The British were very fond of recreational walks and rides, and they built bridal paths in what had been the Udavattekale, the "land above the palace," which in the days of the Kandyan kingdom had been a royal forest forbidden to commoners. 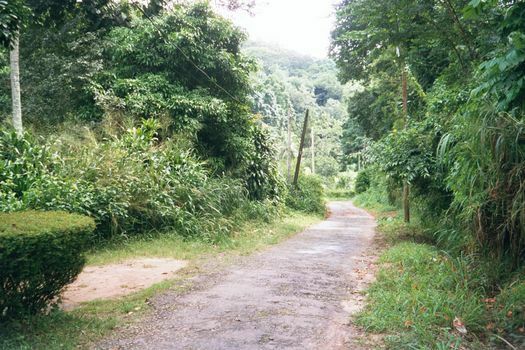 The sign points the way to Lady Horton's drive, one of several walks that still carry the names of governor's wives. 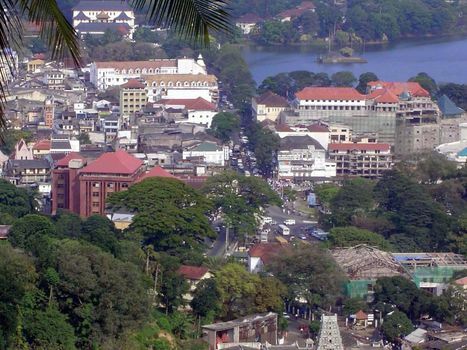 Because Kandy was the commercial center for a very substantial plantation economy, its downtown was highly developed even in the colonial period. The Temple of the Tooth can be seen in the left distance; in front of it is the green area the British called the Esplanade. Then the hotels and stores and banks begin. 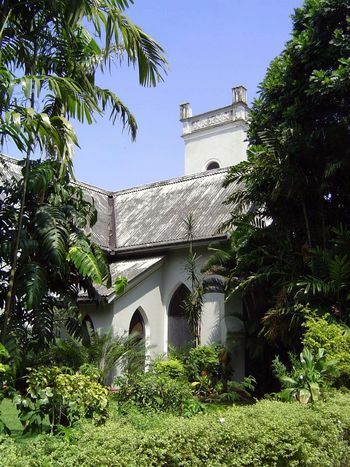 The bit of white plaster under a tiled pyramid in the lower center is still the main police station; even closer to the camera, at the lower right margin, you can see the top of a Hindu temple gopuram. 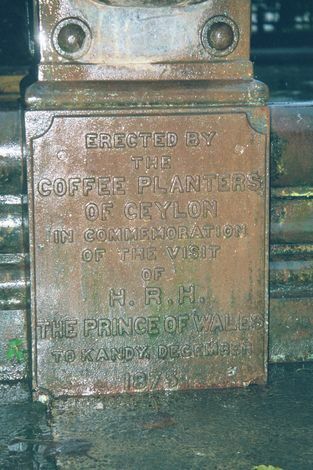 Walk along the esplanade and you'll pass this coffee planters' memorial. Apparently the planters hoped for some royal attention to their problems. They didn't get it; the prince didn't show. 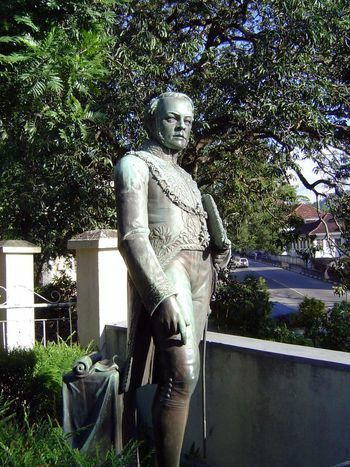 Also on the esplanade was a statue of Governor Henry George Ward (1797-1860), governor of Ceylon from 1855 to 1860; it's been relocated to the museum grounds and in the process has lost its plaque, which included this excerpt from Ward's speeches: "In semi-civilized countries it is with material improvements that all other improvement begins. My conscience tells me that to the best of my judgment and abilities I have tried to do my duty by you, and it is my hope that you will think of me hereafter as a man whose whole heart was in his work." Previously the editor of the Weekly Chronicle, Ward had been a journalist in London before being appointed ambassador successively to the Ionian Islands, Mexico, and Spain. 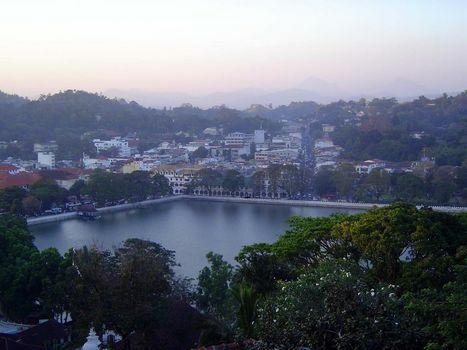 In Ceylon during the years of the Indian Mutiny, he worked to restore ancient irrigation tanks. 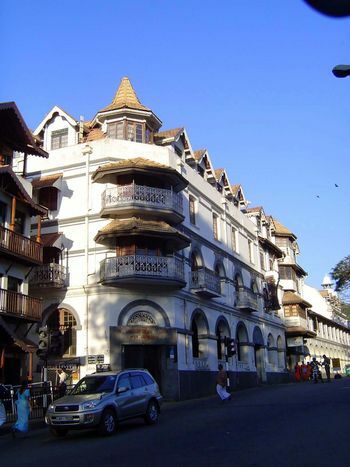 He also established telegraph lines and the Galle Face promenade in Colombo. 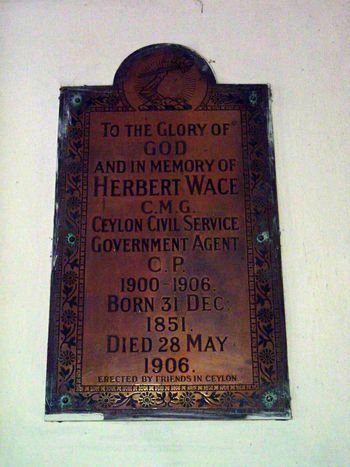 He was promoted from Ceylon to become governor of Madras but died there of cholera almost at once. 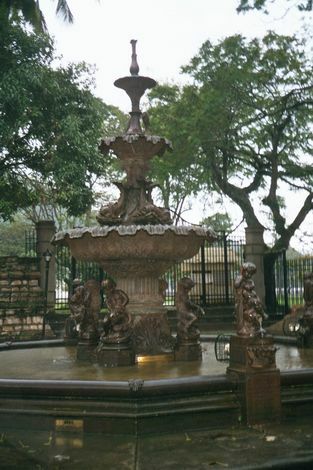 The statue was erected in 1868. 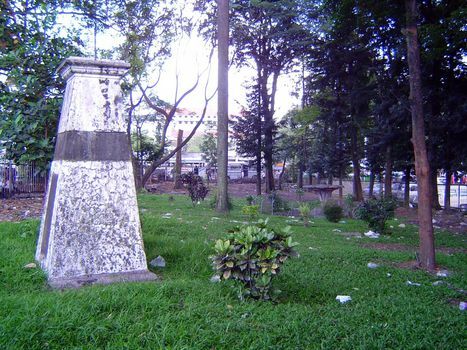 The stripped-bare monument to Henry Byrde (1837-1907). 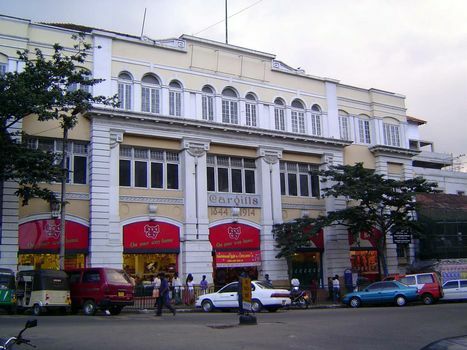 With a military background, serving in the Crimea and later as Commandant of the Ceylon Light Infantry, Byrde went into business in Kandy and in 1873 was appointed the secretary of the municipal council, as well as superintendent of works. He served in those capacities until his death. 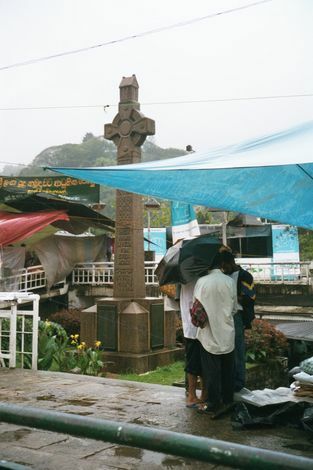 "He was a good amateur actor, had a great knowledge of trees and tree-planting, and was a walking dictionary of information about Kandy, of which he was the oldest European resident...." Survey of Sri Lanka maps incorrectly identify this as the Gyrde memorial. Across the street, a Great War memorial. 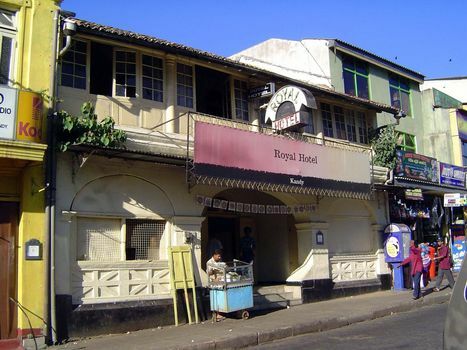 The city's classic hotel, the Queen's Hotel--still in business. 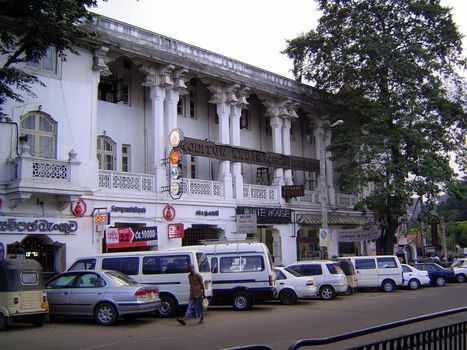 The Queen's Hotel from another angle, showing the entrance to what was the Mercantile Bank of India, where planters heading back to their estates could withdraw funds to meet their payrolls. 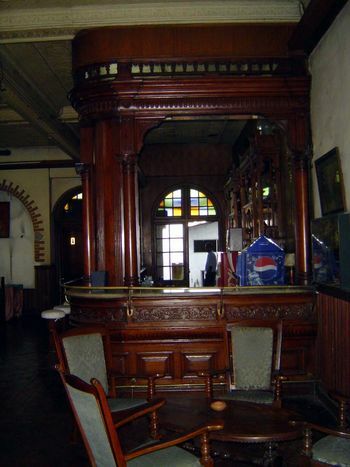 Also in the hotel, a well-preserved bar. 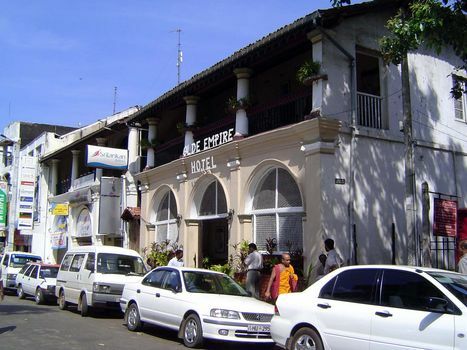 A more modest hotel facing the esplanade. 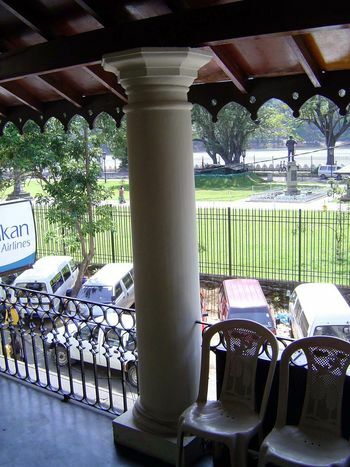 Here's the view from its upper veranda. 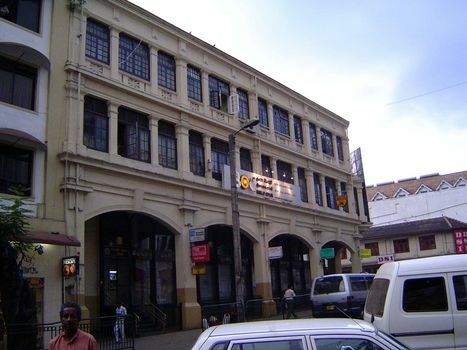 In business for more than a century, Cargills was a diversified corporation, and retailing was just a small part of its business. The company now runs a chain of Food City supermarkets, including this one. 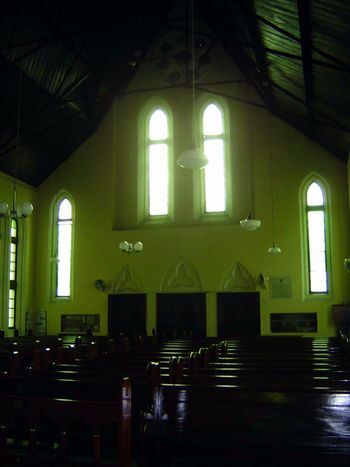 The local branch of the Church of England. It sits on land taken from the Temple of the Tooth--an action not yet forgiven, let alone forgotten. 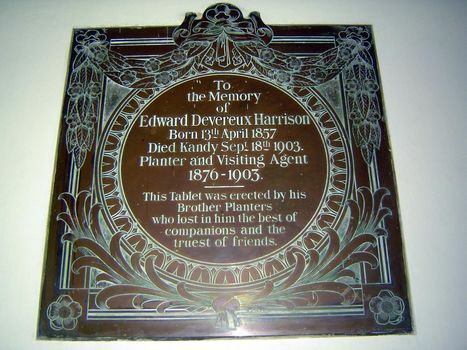 Inside, a plaque to a visiting agent. 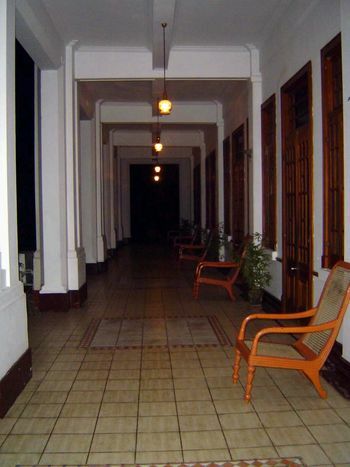 The phrase "truest of friends" may well be accurate, but visiting agents were inspectors sent by absentee plantation owners to check up on their properties, not a vocation likely to win friends. Another plaque, this one to the founder of Wace Park, who died in the saddle. The Church of Scotland, seem from a spot in the churchyard that hides the busy street on which the church sits. 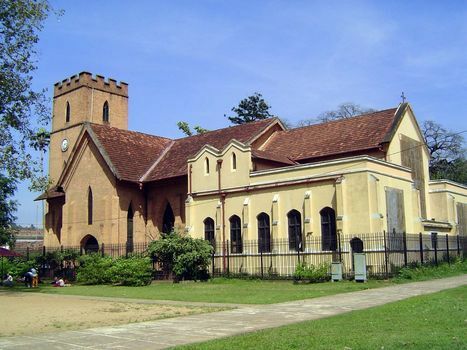 The church was built by and for coffee planters.